welcome visitor as it showed up during our workshop with Peter Pyle. Notes: The first few days of this week overlapped with our banding workshop, with special guest Peter Pyle; for more about this event, click here. On top of that, it was Birdathon week, with Marcel Gahbauer doing his mostly on foot (and with a bit of aid from public transit) in Toronto, the MBO Birdathon team doing theirs entirely on foot at MBO and in the Morgan Arboretum, and the Red-eyed Wearios exploring southwestern Quebec and eastern Ontario; please click on the preceding links for details, and consider donating in support of either effort to help fund the migration monitoring programs at MBO (click here to make a secure online contribution; charitable tax receipts will automatically be issued for all donations of $10 or greater). Now to the "regular" news for the week. Both the number of individuals and species banded this week were roughly average for this time of spring, but much of the activity came in the first half of the week, while the last few days were uncharacteristically quiet for this time of year. 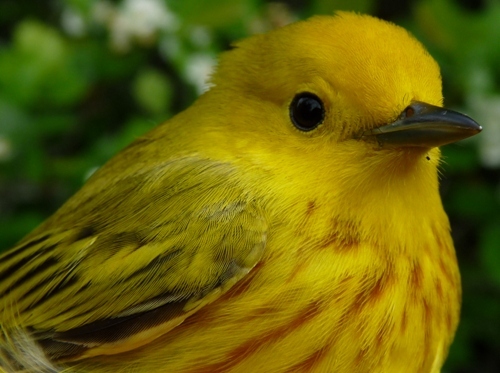 Another dozen species were observed for the first time this year: Wilson's Snipe, Willow Flycatcher, Marsh Wren, Gray-cheeked Thrush, Orange-crowned Warbler, Chestnut-sided Warbler, Cape May Warbler, Bay-breasted Warbler, Blackpoll Warbler, Canada Warbler, Wilson's Warbler, and Scarlet Tanager. We also had a dozen species (many of the same ones) that were banded for the first time in 2010: Eastern Kingbird, Red-eyed Vireo, Gray-cheeked Thrush, Veery, Orange-crowned Warbler, Chestnut-sided Warbler, Black-throated Green Warbler, Blackpoll Warbler, American Redstart, Black-and-white Warbler, Canada Warbler, and Wilson's Warbler. This male Eastern Kingbird was recaptured at MBO on May 18, five years and two days after we banded it during our first spring of migration monitoring. That means it is now in at least its seventh year; considering that Eastern Kingbirds typically winter in South America, it has probably flown at least 50,000 km in its lifetime just during migration! 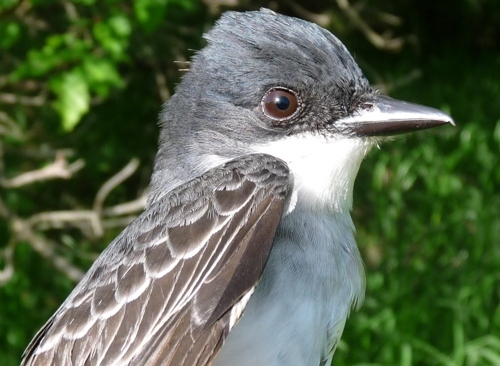 As indicated by the above caption, one of the highlights of the week was the recapture of an Eastern Kingbird we banded at MBO in 2005. 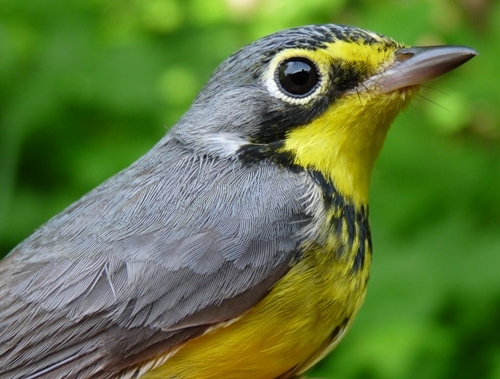 But even more interesting was the recapture of a Northern Waterthrush banded on May 16, 2003 at the Powdermill Nature Reserve in Pennsylvania as a second-year bird, putting this bird within one year of the longevity record for the species. 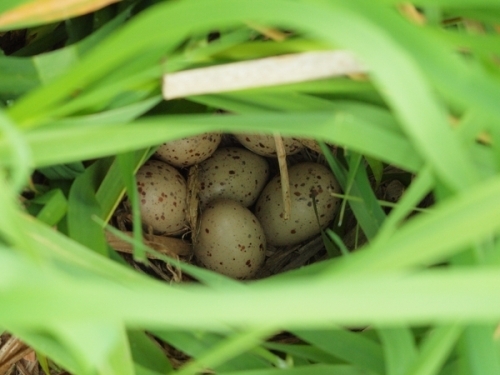 This nest was discovered along the edge of Stoneycroft Pond on May 22 - any guesses? See the end of this week's report for the answer. There was a fair amount of turnover this week with respect to the top species banded. Last week's top five were still around in decent numbers this week, but Yellow-rumped Warblers and White-crowned Sparrows were much less common, while the numbers of Yellow Warbers, Red-winged Blackbirds, and American Goldfinches banded increased. In general there was a modest influx of warblers this week, with Tennessee, Wilson's, Northern Waterthrush, and Common Yellowthroat also all common enough to make the top ten. One of the various Yellow Warbers that provided us a great overview of the characteristics of different ages and sexes during the workshop with Peter Pyle. 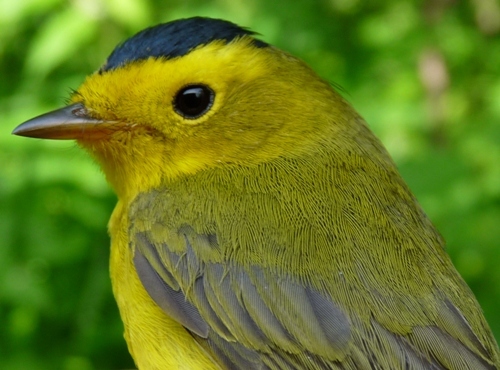 A handsome after-second-year male Wilson's Warbler that showed up amidst the more common Yellow Warblers. 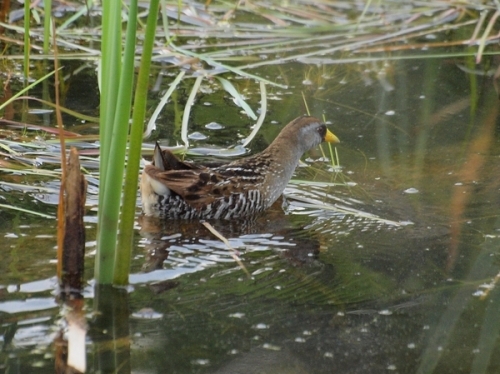 And here's the answer - the nest shown above belongs to this Sora, a species that has been observed at MBO most years, but has not previously been confirmed as a breeder.